Great Bible verse review game for families or Sunday School classes that work with any verse. This is a very simple and inexpensive bible verse review game. It works for children 1st-4th grade. In our 2nd grade class of 50 kids we divided them into 8 groups of about 5 each. You’ll want to keep the groups to no more than 7-8 kids per group to allow all the kids to participate. You’ll need cups, about 8-10 cups per group. We used sturdy Target “Solo” cups that we reuse. Print 2-3 words from the verse on each label. Affix labels to cups. (note every other label should be “upside down” so they look correct when stacking. 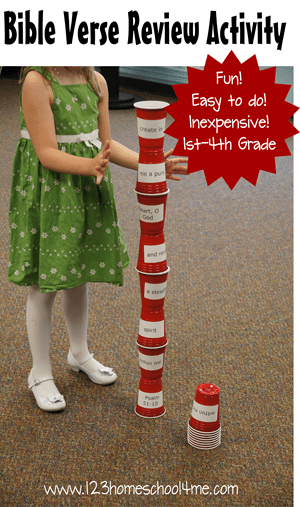 Have the kids stack the cups to put the verse in order. Note: By printing labels the words are not only neater/easier to read and convenient to do with a large group, but it also makes it easier to reuse the cups. Just carefully peel off the label or put a new label on top of the old label. The kids thought this was a really fun activity and was a great way to practice their memory verse. The activity takes about 10 minutes.